The Northwest Civil War Council does offer School presentations. Contact Earl Bishop NCWC Chairman at earljbishop@hotmail.com to set up a school presentation and go over the particular interest you may have. Currently we are planning a School day at our House on the Metolius Event at Camp Sherman Oregon on May 17th 2019. We welcome public and private schools as well as home school families and groups. The day schedule is in the works currently for the school day. It will have infantry, cavalry and artillery demos. As well as civilian life and period merchants, etc. Our event coordinator for this event, David Banks, can be reached at dbanks@bendbroadband.com please contact him to make sure we know you want to join us and get details. How Much: $2 per student. Contact David Banks if concerned about cost. 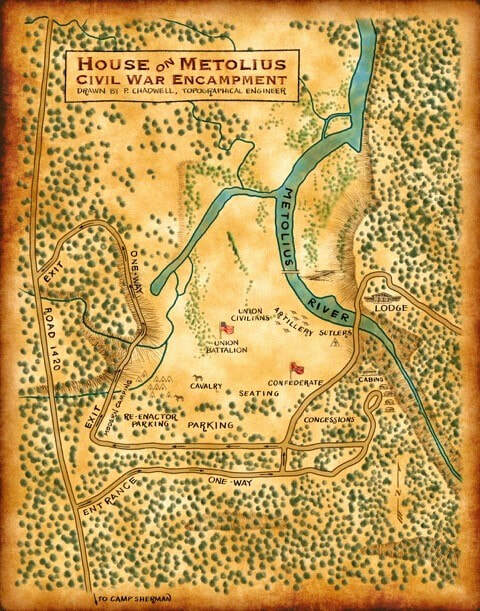 How to Pay: Make checks payable to: Northwest Civil War Council / Metolius. of payment will be issued on the spot. From Sisters, Oregon: take US Highway 20 (OR 126) 10 miles to the Camp Sherman exit. Turn right on Road 1419. Go 2.6 miles; stay left at the first intersection. After 2.1 miles more, pass the Metolius Meadows neighborhood on your left. At a 4-way intersection with a stop sign, continue straight. In a half mile another intersection is marked Allingham Guard Station. Don’t turn, continue straight on Forest Service Road 1420 for 1.2 miles, crossing a small bridge and two small rolling hills. Look for the signs for “House On Metolius” and turn right onto the red cinder road. Go down this road a quarter mile and look for directions and a left turn. Please review the Spectator Guidelines below. They are mostly common sense: be polite, stay out of the river. here are some things you will want to keep in mind. Dress comfortably for the weather and plan to stay the day. Please leave your pets home! Do walk through the camp areas. Most re-enactors love to discuss history - sometimes in 1st person - and you will feel like you are really there! Skits and impressions go on all day. Period cooking, daily soldier activities, civilian businesses, hospitals, are daylong and worth exploring. Depending on weather bring an umbrella, sunscreen, sunglasses and a hat. Binoculars help to view distant battlefield action. Food and water are available for sale. Bring your camera or video. Leave your cell phone off, using it just for pictures. Some carriers don’t provide signal in this area. Remember, this is in the year 1862 or there about, so unless you are sending a telegram, leave the electricity behind. If sitting near a cannon, open your mouth wide when it fires. This will help equalize the pressure. Your inner ear will thank you. Watch your step around the fire pits and cooking stoves. Supervise children at all times, especially NEAR THE RIVER. Do not open or enter a closed tent. Do not handle small display articles without permission. Please do not sit, play or pose on the cannons. Do not enter the battlefield until battles and demonstrations are completed. Do not approach or feed the cavalry horses without permission. Enjoy yourself, and life in the 1860’s! If you have any questions, don’t hesitate to email. This will be a great way for your students to learn history.